Seat Alhambra Ecomotive: driven | What Car? Seats Alhambra was launched way back in 1996, when Take That split up and the Spice Girls took their place. Yet 13 years on, the Alhambras still going strong. By way of a celebration, Seat has given it the Ecomotive treatment that means various aerodynamic, suspension, engine and gearbox tweaks to bring CO2 down to a very reasonable 159g/km, and average economy up to an equally pleasing 47.1mpg. 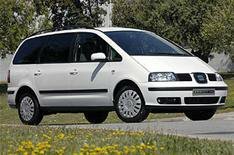 As seven-seat MPVs go, the Alhambras a bit old hat. Sure, theres decent room for seven people (unlike many more modern compact MPVs) the qualitys good and theres a decent amount of kit on board, but the Seats seats dont do anything especially clever. You can fold them up and take them out, but theyre awkward and heavy. The Alhambra doesnt feel 13 years old on the road, but the ride is a little bit lumpy and the old-school diesel engine is a bit gravel-voiced.